Do you ever have enough storage? Families tend to have quite a variety of belongings these days. Whether you’re an active group with lots of hobbies or you rely on an assortment of equipment to make your living, you might have noticed that some of your stuff takes up a lot of room. Can you relate to any of these statements? • Some things you shouldn’t really keep in the basement. • You’re under some pressure to clear out your garage so you can actually park a vehicle inside. • It’s time to find a better place to keep your ATV or boat than under a tarp or one of those tent garages from Canadian Tire. • You’ve acquired a lot of tools for your woodworking or D.I.Y. projects and you really need a workshop. • It’s a good idea to get your toys and tools safely out of sight and secure from thieves. 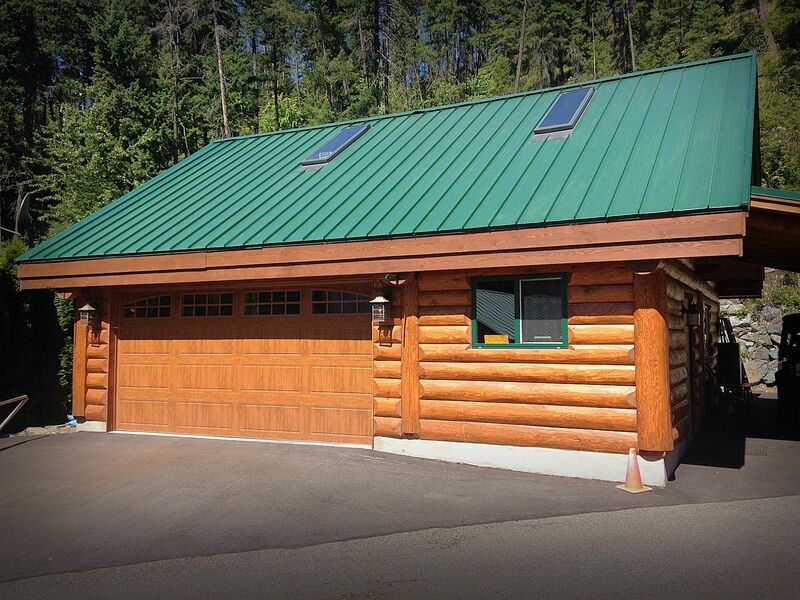 Whether you’re thinking of an outbuilding that will blend in well with your existing log home or you just want a unique garage or barn with remarkable strength and character, consider a log or log post and beam structure. Timber frame is another eye-catching option when you want wood craftsmanship in a traditional style that adds distinction and value to your property. Simple buildings without complex roof systems or many corners are the most budget friendly. The common rectangular shape of storage facilities is both practical and economical—but much more appealing when it’s built with log or timbers! As you’re contemplating a place to keep the necessities you’ve acquired (whether you’ll be housing dirt bikes, paddle-boards, kayaks, table-saws or livestock) ask yourself if you might need more living space too. Adding a few extra square feet or a loft to your outbuilding can reward you with an extra guest suite, a gym or a man-cave. What exactly is log post and beam? Learn more! Maybe you’ve finally found a piece of property or a rural acreage where you’d like to build your log dream home, but you’re not quite ready to make the move. Get started with a log cabin garage that includes cozy living space and you’ll be ready for weekend and holiday getaways. 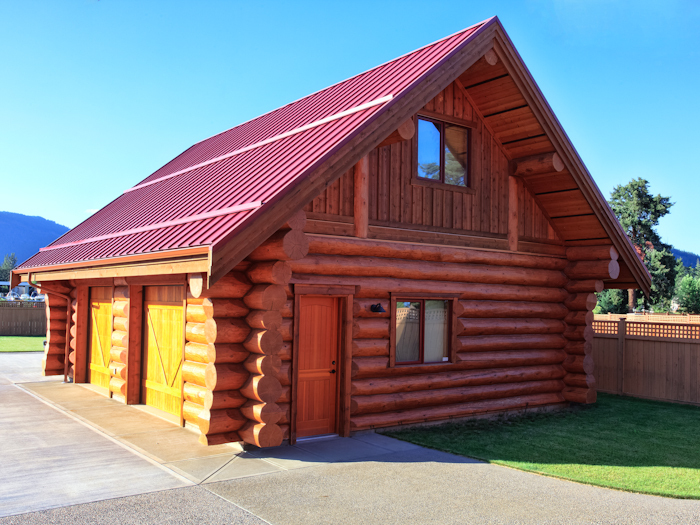 When the time comes to build your custom log cabin you’ll already have a garage and a guest house! Tip: It’s always an advantage to spend a lot of time on your property before you build. Learn where the sun rises and sets, the direction the wind usually blows, and the habits of your neighbours. This will help you design the ideal plan and placement of your home! 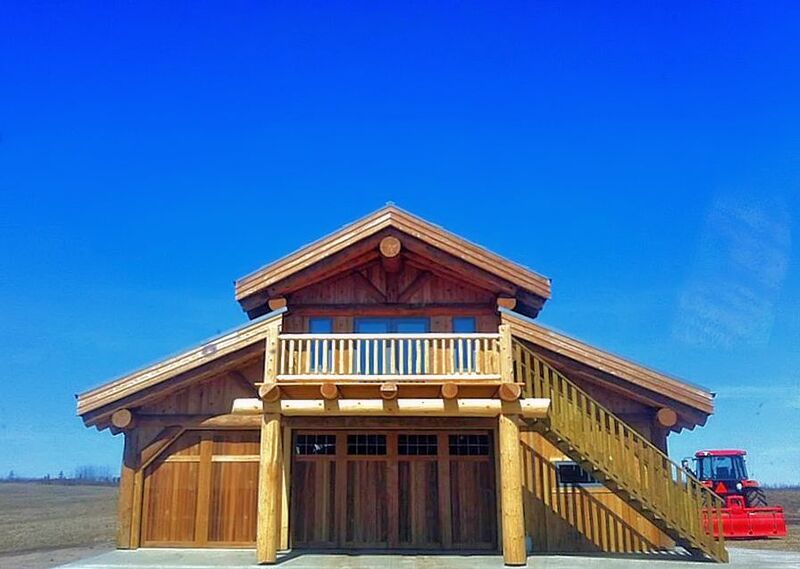 Whether you’re contemplating a log barn or an equipment shed, a workshop or a garage, handcrafted log construction offers you superb quality and durability. It’s a winning combination of raw beauty and security, adding value and convenience to your property and home! 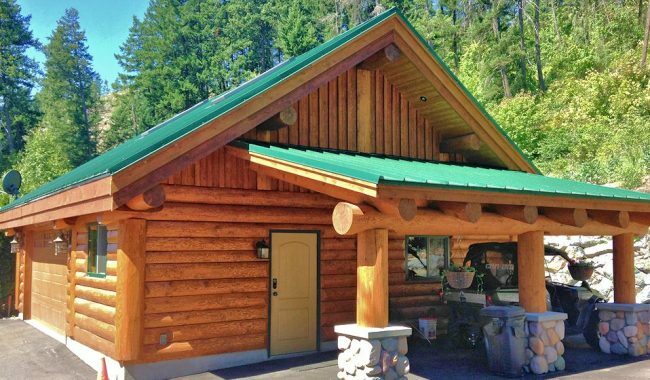 Contact North American Log Crafters today to talk about a log garage or outbuilding!